Cooking is a great way to create delicious food. However, it also ends up creating a lot of dirt and waste—especially liquid waste, or grease. Over time, cooking can build up waste, and if left unchecked, it is not only disgusting, but it also can be a complicated and expensive process to fix. For instance, the buildup can block sewage lines, which is a whole other problem in itself. In the end, any working kitchen will create waste over time, and a way to prevent waste from causing more serious problems is by installing a grease trap. With the first patent for a modern day grease trap being issued in the late 1800s, grease traps have been used since the Victorian era. A grease trap, or a grease interceptor, is a trap in a drain or waste pipe that prevents grease from going into a sewer system and potentially causing a blockage. Today, they vary in size, from large commercial grease traps to smaller, residential grease traps that can connect to sink. A simpler explanation of what a grease trap is: a plumbing fixture that traps and holds decomposing food waste, such as grease. Grease traps work by catching fats, oils, grease, and other types of liquid waste while separating them from wastewater and solid food waste. These traps are placed between kitchen wastewater and the sewer, consisting of a container that water flows through, straining out fats, oils, and grease with a serious of baffles and retention reservoirs. As mentioned above, the size of these containers can vary. However, smaller units are installed under a sink while larger units are generally installed outside or underground. Grease traps usually have two other main components in addition to the container: the crossover pipe and outgoing line. Let’s briefly look them over. As briefly covered above, the purpose of the grease trap container is to capture the wastewater that drains through the sink, acting as a reservoir. As the wastewater cools, the trapped oils, fats, and greases harden. Once hardened, the grease is lighter than the water, and therefore, will float to the top of it. The wastewater is then pushed through the crossover pipe while the greases and other solid wastes stay in the container. Once the grease and solid waste have been separated, the water continues to flow through the crossover piper. This pipe features a second filtration system for the passing wastewater, eliminating most of the remaining solids from the water. Once the water passes through the crossover pipe, it carries onto the outgoing line. The purpose of the outgoing line is to eject the filtered wastewater into the sewer system. The outgoing line is designed to enable the grease trap to keep its liquid level. Having a proper liquid level is vital to ensure that the trap continues to separate grease, solid waste, and water. 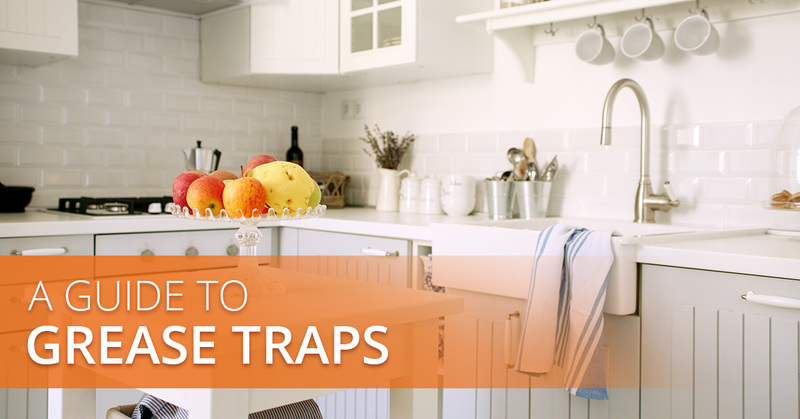 A grease trap can be a priceless addition to any working kitchen. Grease trap installation can have many essential environmental and financial benefits. Check a few out below. A grease trap is a hard-working addition to a drainage system. Because the fats, oils, and grease are separated from the wastewater that is passed through into the sewage system—which, as mentioned can prevent major plumbing issues. If warm grease were to pass into the sewer system, it could potentially lead to blockages and flooding around the nearby areas. Blockages in a sewage system can cause expensive damages and repairs, therefore, installing one can save you time and money as an economical safety device. Plus, grease traps are not as expensive as some may think, making it a compelling long-term solution to caring for your drainage systems. Grease interceptor installation is a great way to be environmentally friendly, too. This is because instead of dumping harmful fats, oils, grease, and other wastes into local streams and rivers, they are filtered out and stored in a trap’s container. Maintaining a grease interceptor is generally hassle-free and worth the price for all of its benefits. There are other environmental benefits, too. Not only does liquid waste not run into our oceans, the solid waste that is collected in the grease trap can be used to create agricultural mulch. When it comes to grease trap designs, two of the most common materials used are fiberglass and concrete. However, fiberglass grease traps have numerous advantages over concrete grease traps. Check out some essential advantages fiberglass traps have over concrete ones. Concrete grease traps are susceptible to corrosion over time due to their porous interiors. The permeable material enables bacteria to accumulate. Once formed, the bacteria can end up degrading the concrete over time. Unlike concrete, fiberglass is a non-porous material which prevents the accumulation of bacteria. Bacteria is unable to degrade the material, plus fiberglass can even withhold more harsh contents, like sulfuric acid or sulfide—which can erode the porous interior of concrete grease traps. Concrete is known to expand or contract due to changes in the climate. When concrete expands or contracts, it is more likely to crack and leak. Fiberglass will not expand or contract in changing climates and the material will last much longer while requiring less maintenance and repairs. Fiberglass is lighter than concrete. In fact, a fiberglass grease trap can be 30 times lighter than a concrete tank. In addition, fiberglass traps are manufactured as a whole unit, which makes transportation and installation easier. Concrete tanks often have to be manufactured in sections, making the transportation and installation process more complex and time-consuming. Not to mention, concrete grease traps can take up to a month to install due to the cure time required when tanks are installed using the cast-in-place method. Fiberglass tanks usually take about one day to install. As you can see, fiberglass grease trap installation can have numerous benefits. 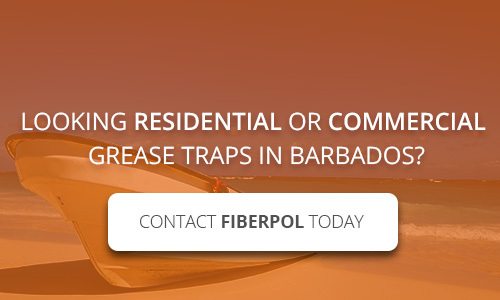 If you are interested in a grease trap in Barbados, contact Fiberpol! Fiberpol is one of the leading sellers of fiberglass grease interceptors in Barbados and the surrounding areas. Whether you have been looking for residential or commercial grease traps for sale, contact our team today and ask about our grease trap specifications.